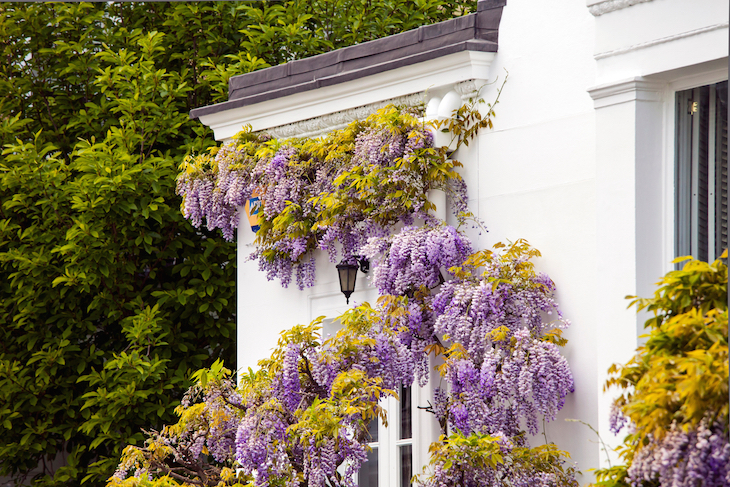 Wisteria usually blooms in London towards the end of April and into May, depending on weather conditions. Walk through the Sexby Garden (no sniggering) in Peckham Rye Park at any other time of year, and the main attraction is that very blue fountain (seriously, what do they put in it?). 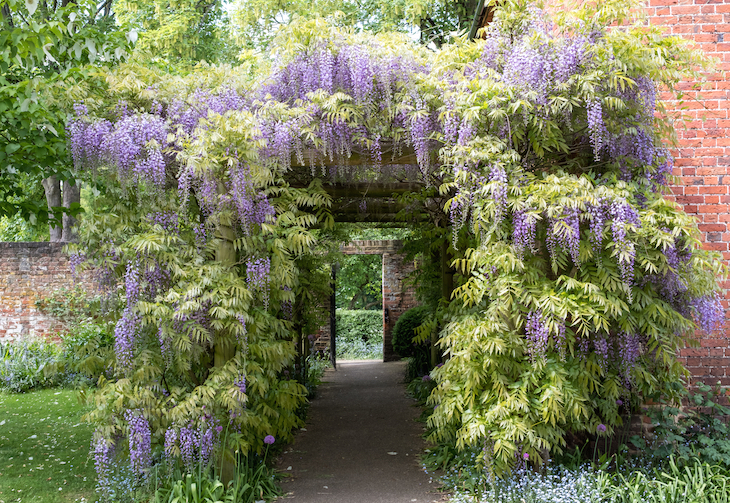 But for a few weeks in spring, the usually-naked pergola transforms into a beautiful lilac tunnel, dripping with tendrils of wisteria. It's satisfyingly symmetrical, with plenty of other green foliage surrounding it... and it's far enough out of central London that it's not plagued with photographers (head there shortly before sunset and you may have the park to yourself). Ideal photography territory. For photographers, this quiet west London back street is the gift that just keeps giving. In autumn, the beige stone arch drips with blood red foliage, creating an almost gothic illusion. Then spring rolls around, and the wisteria blooms. The best wisteria hunting ground lies to the western side of the road, past Launceston Place, where one house in particular disappears behind a lilac curtain for a few weeks of the year. The cobbled street and mews-style houses combine for an extremely bucolic look, making for great photos — just be mindful that someone lives there if you're heading out for some shots. The building's blue plaque — dedicated to composer Frank Bridge who once lived there — is the cherry on the top of a particularly pretty cake. Basically, it's the London house we dream of living in, until a little thing called reality kicks in. Find the house towards the eastern end of the street. We assume it's the outer London location that prevents this wisteria tunnel getting the love it deserves — because by heck, does it deserve it. The walled garden is thought to date to the 17th century, and underwent a renovation in 2014, but thankfully the wisteria-covered pergola was left standing. It was planted in 1986 so is a fairly well-developed tree, creating a foliage tunnel leading to a gate in the brick wall, a sight that puts us in mind of children's book The Secret Garden. Not content with wowing us with twinkly lights at Christmas and a sea of colourful tulips in April, English Heritage owned Eltham Palace offers something for wisteria hunters too. The decorative stone column pergola at the eastern end of the building look somewhat bare for a lot of the year, but come May, wisteria twists and twirls its way round them. The wooden footbridge across the (empty part of the) moat gets in on the action too, the rugged brickwork and rustic wood railings draped in the grape-like bunches. It's not the biggest wisteria offering in London — and you will have to pay an entry fee to catch a glimpse — but the art deco/Tudor mansion is worth a visit in its own right, and makes for an interesting photo backdrop. 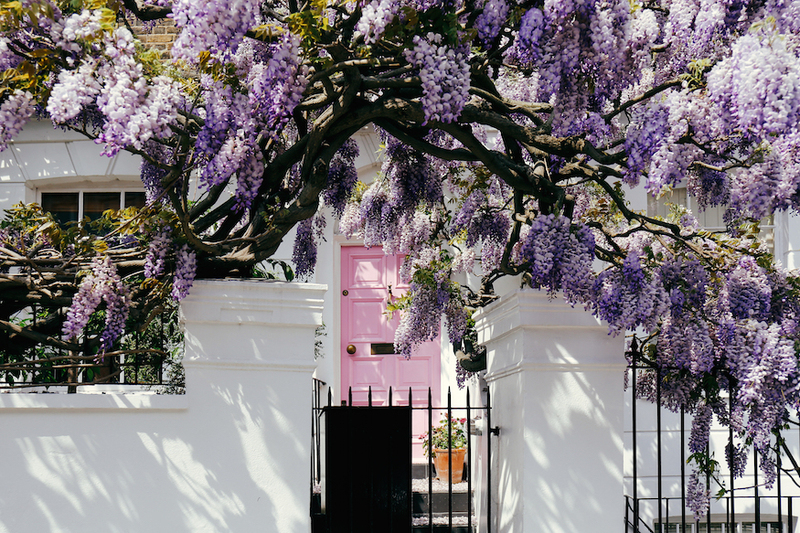 For riverside wisteria hysteria, Chelsea's petite Cheyne Walk has a cluster of houses where pink-purple blossoms curl around the wrought iron railings, drowning a first-floor balcony in a riot of pastels. Streets that have a lesser amount of wisteria, but still worth seeing if you're in the area during the season. Elm Place, Chelsea — several houses on the street get in on the wisteria action.